Bridal hairdressing and visiting hair stylist for weddings in the UK - bride's hairdresser. We are looking for the very best wedding hairstylist across the UK. Professionals with the experience to deliver a first class wedding hair service to the bride and her bridal party. 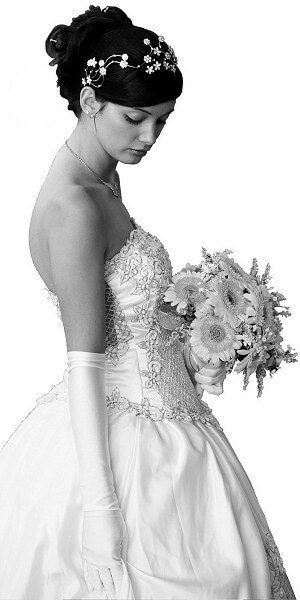 Most brides realise they need a specialised wedding hairdresser for their big day. Bridal Hairdressers UK provides the link between the bride and you, making it easy for her to find a professional bridal hairstylist. What do I get when I join the network? As a professional wedding stylist you know just how stressful it can be for the the bride on her special day. You also understand the importance of choosing an experienced bridal hairdresser such as yourself, but how will she find you? The bride's usual hairdresser may not have the skills or experience necessary to work on location and deliver the level of service required under wedding day conditions. That's why so many brides-to-be use our network to find the perfect stylist locally. Absolute exclusivity in your town, a multi-page bridal website, unique domain name & email address. Each site is fully optimised for Google, Yahoo and Bing... and is linked into our UK network so you benefit directly from all of our visitors, national marketing activities and local wedding hairdresser searches. So long as we don't have a member in your town and you are experienced in wedding hair, you have the opportunity to increase your business. All enquiries generated by the network go directly to you. There is a small cost of only 37p per day to be part of the network. No fixed contract, No small print, No hidden agenda. The enquires generated from the network will be the reason you stay with us. Call us at local rate on 0845 108 60 70 or email. If your town is not on the list to the right, no problem! So long as we don't already have a stylist in the area, we'll build your site, add it to the network and start generating enquiries for you! Our brides deserve the very best and Bridal Hairdresser is appointing just ONE experienced wedding hairstylist in each town or city across the UK, so register your interest now by completing the form below... before your area is taken!